Here is the Product Detail you requested! This practical, seven-session course focuses on topics important to parents today. 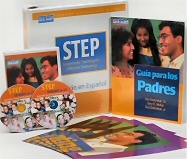 Easy to understand and apply, STEP in Spanish presents effective communication skills that can be used immediately. Dynamic video vignettes let parents see how easy it is to put STEP skills to work at home. Discussions and activities make session times flexible - running between 1-2 hours each. For parents of school age children (Age 6-12). Part of a set of 5. "STEP Complete Kit (DVD format)"